If you isolate Armenia's football history after the dissolution of the former Soviet Union and you look at what has happened within the borders of the country ever since, you'll be left wondering what are Ararat Yerevan doing here, why isn't this article about Pyunik, the... emperors of Armenian football since the early nineties. The fact of the matter is, Pyunik may be the biggest club in the country in modern times, but looking at the bigger picture, taking into consideration the history of football in Armenia since it started being played there, no club will ever be anything like Ararat. Founded in 1935 as Spartak Yerevan, the club won their first title, the Cup of the so-called Socialist Republic of Armenia in 1940, interestingly as Dynamo Yerevan, a name they had adopted two years earlier, and kept until 1953. This is the name under which they first competed in the Soviet Top League as well, in 1949. In 1954 the club switched their name back to Spartak, until 1963, when the management passed to the Armenian republican sports society Ashkhatank, and the name Ararat (after the famous mountain, within Turkey's borders, but clearly visible from everywhere in nearby Yerevan, a name practically sacred to the Armenians) was used for the first time. The seventies were undoubtedly Ararat's golden era. Try imagining any Armenian team of these days not just competing in the Soviet Top League against giants like Spartak, CSKA, Dynamo, Lokomotiv Moscow, not to mention Dynamo Kyiv from Ukraine and top clubs from other Soviet Socialist Republics, but starring in such a competitive environment. In 1971, they finished second in the championship, “warming up” for two years later. The fact that at a small distance from Hrazdan Stadium, Ararat's home in the seventies, there are statues of every single member of the 1973 squad, speaks volumes of the magnitude of their success, and the importance it holds in Armenian football's history. Ararat won the Soviet Top League and the Soviet Cup that season, led by legendary former player Nikita Simonyan, one of Soviet Union's most prominent football figures, who had started a coaching career 13 years earlier. Alyosha Abramyan, Arkady Andreasyan, Levon Ishtoyan, Oganes Zanazanyan, Nazar Petrosyan, Eduard Markarov, Alexander Kovalenko, these are some of the names that give goosebumps to Armenian football fans, not just Ararat's, players who really put not only Ararat, but Yerevan and Armenia in general on Soviet Union's football map. The team won a second Soviet Cup in 1975, and next season they came close to repeating their 1973 epic success, finishing second in the championship, and reaching, but losing, the Cup final. Before that, Ararat had made sure to make their name heard outside the Soviet Union as well, by reaching the quarterfinals of the 1974–1975 European Cup, today's Champions League. Bayern Munich, who later that season won the title, proved too good for Ararat, even though they did lose 1–0 in Yerevan, in an absolutely packed Hrazdan Stadium. These days, Ararat players are lucky if they play in front of a few hundred fans, relatives, friends. Back in the seventies, in the newly-constructed Hrazdan Stadium, in times when the stands had no seats, so it was easier to pack in more fans than in modern times, Ararat used to play in front of 70,000 people. Think about which teams in Europe and elsewhere in the world play these days in front of such crowds, and you realize just how big Ararat used to be. 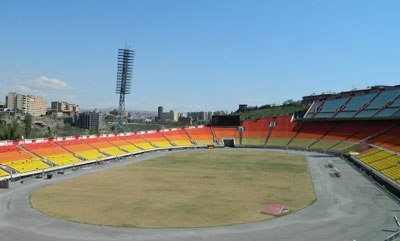 Ararat's home back in the seventies, historic Hrazdan Stadium, with its very characteristic masts, and the eastern stand deliberately lower than the western, so as not to block the view over downtown Yerevan. Right after Armenia became an independent country, Ararat won the second double in their history, albeit a much more modest one. Things looked promising, the team continued to fight for the Premier League title almost every season until the end of the century, they won three more Armenian Cups, but in this first part of the 21st century Ararat have practically collapsed. A couple of second finishes in the championship and a fifth Armenian Cup in 2008 don't cover up the fact that the team have fallen too low, as low as in the second division, twice, in less than ten years. Legendary goalkeeper Alyosha Abramyan, one of the biggest keepers in the former Soviet Union, played in 331 official matches for Ararat, and his record was only broken by midfielder Khoren Oganesian in the mid eighties, towards the end of his last season at the team. Also known as Hovhannisyan, when he left Ararat, aged 30, he was not only the most capped player in the club's history, but also their all-time leading goalscorer, with 111 goals (in 341 official games), having left behind him other legends of the Yerevan club. Oganesian was not a member of the 1973 team, he joined Ararat right after that, but he is widely considered to be the biggest Armenian player of all times. Today's emblem features an eagle and the name of the team both in Latin and Armenian characters, but in Soviet times, after adopting the name “Ararat”, the logo actually included the shape of the very characteristic peaks (two) of the mountain after which the club are named. It also included a big “Ա”, which may look like a Latin “U”, or maybe a roofless “Q”, but is actually the Armenian character for Latin “A”.